Originally a manufacturer of lawn and garden parts and accessories, Spyder Manufacturing has been through several transformations. Once employing more than 30 people, the company experienced a sharp decline when global competition forced a downsizing of production, employees and profits. Back then, Gary Monnig would often say that the machines owned by Spyder were so old and rudimentary that the company “maintained a stable of hamsters just to power them.” Spyder was spending thousands of dollars for outsourced machining, both locally and overseas, especially for more complex parts. Soon, a new Fryer MC40 milling machine, sporting a Siemens 840D control was delivered and installed on the company’s shop room floor. There it stood, awaiting the arrival of Fryer’s field service engineer to instruct the staff on its operation. What they didn’t know was that Monnig had the flu. He was taken to a hospital emergency room, pumped with fluids, and given two days of care. When he returned to the shop at the end of the week, he was ready to learn CNC machining. But now there were less than four hours of scheduled instruction remaining — hours that would prove to be a turning point for the company. Having earned a living as a tool and die maker, Trever Lowe may be among the last of a dying breed. He joined Fryer Machine Systems because he wanted to work for a leading American machine tool manufacturer. And, he wanted to teach. One of his first assignments with Fryer was to travel to Spyder Manufacturing to teach Matt Monnig how to setup, program, and operate their new Fryer machining center. Calling upon his many years as a machinist, Lowe understood that what his new student needed to learn was the one thing that every future machinist needed to learn. In the span of a few hours, Matt needed to learn to use a CNC machine for the first time. Not only that, but he was learning on one of the world’s most powerful controls, the Siemens Sinumerik 840D, to program complex contour milling, right at the machine. Ahead of Trever’s arrival, Matt was a restless student in waiting. Influenced by conventional wisdom, he had invested over four thousand dollars in a leading brand of CAD/CAM programming software. Lesson learned, say both men. The ability to program at the control brings a competitive advantage to a shop. It empowers both the operator and the shop owner to efficiently produce more than they could otherwise. Instead of waiting for a CAD/CAM programmer to feed a G-code program to a machine, an operator can quickly setup the next program and keep production rolling. Spyder Manufacturing is also the story of how a greater return on CNC can mean a greater return on a shop’s workforce, enabling a business to leverage the skills and knowledge of its people to create new opportunities for the company. Matt Monnig recalls how, from the earliest days of the company, Edward Jones was an especially resourceful machinist. Called upon for his hands-on perspective, Jones found ways to create new product ideas, using whatever were the tools of the day, long before the dominance of CNC machining. The new product design was soon validated by the CAD/CAM capabilities of the Siemens control. 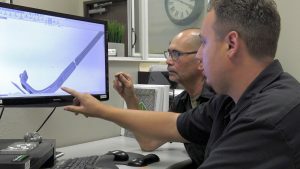 Using highly intuitive, graphically-guided functions such as the contour calculator, the shop could readily conduct design for manufacturability refinements right on the machine. And at the same time, they were establishing the program to produce it. With no G-code language barriers in the way, the shop could conceive, design and produce a new generation of products. Today, Spyder Manufacturing is a company transformed. 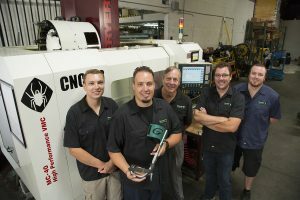 For Gary and Matt Monnig, achieving a greater return on their CNC investments includes taking greater control of their business, enabling their people and operations to become increasingly efficient. 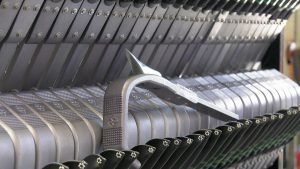 Now the company produces parts for customers overseas, rather than the other way around. Spyder is also able to bring next-generation products to market and efficiently keep pace with the demand for those products. Including products made possible by bridging “old world” machinist skills and knowledge with creative leadership to capitalize on the most intuitive and powerful CNC available. “The Fryer machines have paid for themselves many times over,” Matt Monnig says. The company owns three Fryer MC40 milling centers, all equipped with Siemens Sinumerik 840D controls. 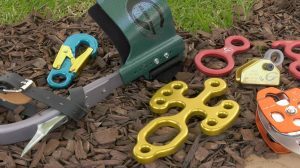 Before the company’s investment in Fryer and Siemens, it took their shop a month to produce 50 sets of tree climber products. Now the shop produces nearly 500 sets each month. Higher production capacity and efficiency have brought a near tenfold increase in the sale of the company’s flagship product, the same product whose evolved design was first thought never to work. Looking back, Gary Monnig and his son Matt consider themselves fortunate to have stumbled upon the best possible strategy for revitalizing their business. Looking ahead, they plan further investments in Fryer-Siemens machines, knowing that anything is possible given the right set of circumstances: the managerial desire to ask what if, the strength of a machinist’s imagination to see the way, and the power of intuitive CNC to make it happen.